The Call For Papers for the next Southern California Linux Expo aka SCaLE is open and I need your help with the MySQL Track. We have had a MySQL track for the past few years and this year I have gotten permission from the organizers of SCaLE to get a group of MySQL community members to review the talks for this track. This year was pretty good but to make 2019 even better we need more submissions from more people AND THIS MEANS YOU!! The link above has the details on how to register to submit a talk submission and the process is fairly simple. But if you would like help with your submission, want to 'rubber duck' ideas, or want a quick review before you submission please contact me (@stoker, david.stokes @ Oracle.com) or find me at a show. So what type of talks do we need? We need to cover material for newbies, intermediate, and the experienced. There are lots of developers, Devops folks, hobbyists, and students just waiting for you to share your knowledge with them. For a large show, we have a fairly intimate talk space which is friendly to first time presenters. 1. So how do you do backups and restores? What sort of things get deleted and what steps do you take to keep your data safe? Policies? Procedures? How does a developer who fudged a row/table get their data back in your organization? 2. How do you reduce SQL injects, the N+1 problem and 0(N) searches in your code? 3. How is your Kubernetes/Docker/Ansible environment for your developers managed? 5. MySQL Replication best practices. 7. Query optimization for novices. 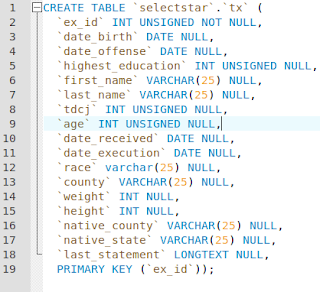 Query optimization for the advanced SQL coder. And anything else you think that at least one other person would like to hear about (and there are more - believe me). So please make SCaLE 17x even better! You have until the end of October to submit. And they wanted want to update t_1 to change value from 0 to 1. I will not repost their code but to my eyes it looked convoluted. So How Do You Get There From Here? But how to get deeper?? By using select doc->>"$.textures[*]" from zz1 limit 1; we get all the info under the textures key. But there are two t_1s! Not really confidence inspiring ,eh? So lets change one of those zeros to a nine. So did we change the first or the second t_1?? But lets double check and change the second t_1 also. Hopefully that second one will end up with a value of seven. So now we can get to the exact values we want. 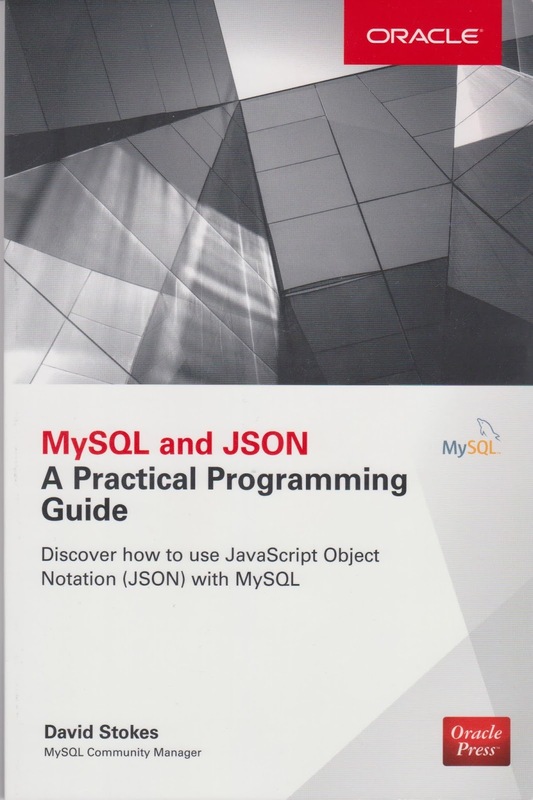 So lets look at the section of the JSON document and annotate in red the paths in the document. Hopefully this will ease someone's confusion down the line. And please do buy my book. Peter Zaitsev of Percona posted a Tweet about an interactive book Select Star SQL which 'aims to be the best place on the internet for learning SQL'. This interactive book uses a data set that can be downloaded or you could work the queries online. I showed the website to a neighbor who was asking 'what is the best way to learn SQL'. The neighbor wanted their own copy of the data and asked how do you turn a raw CSV file into a table. Well, that can get complicated. CSV files use commas to designate each field in the file. This is a great idea until someone plants a comma in the middle of a field but it is sort of a least common denominator way of passing data between systems. But a CSV file does not directly fit into a relational table. You could shove all the data into a JSON column but that is not what we want. What is needed is a peek at the data in the CSV file to see what the various fields are and possible hints at the types of data therein. So download the data and please follow along. Traditionally it took a bit of data sleuthing to examine the CSV file to determine how the data needed to be handled to fit into the relational table even before you fired up your database client. Looking at the first few rows under the headings we can get a good glimpse at the data types for the columns. What we want to do on the first pass is to see if values are strings (CHAR), Integers, Realm and the like. It also helps to look for some field that can be used for a primary key, hopefully a column with unique values. Execution INT Primary key?? Unique?? In this case it looks like we could use Execution as the primary key. Now we need to go through the data to see what fields need special handling. Are the possible INT fields all positive values (unsigned), could we use ENUMs anywhere (Maybe Native Country or Native State or Eye Color). Also, for metric fans, the Height column uses imperial measurements which may not fit a company policy of metric only (or cubits). Plus Height has two components -- Feet and Inches -- that we may need to break down later or we may want to record all this data in inches. We will not cover that in this blog post (but we could cover if I get enough folks asking for how to do this). So making a best guess, lets assign lengths to the CHAR fields. Please note that I will be using VARCHAR instead of CHAR in the above and use CHAR just for clarity. We could of course create a table like that below and then load the data file. 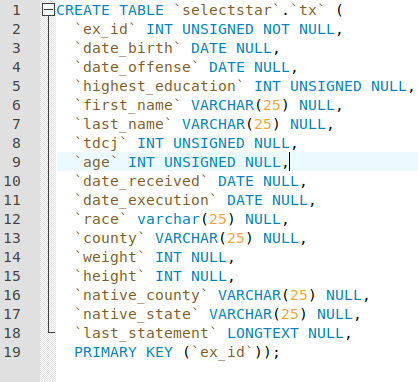 MySQL Workbench makes quick work of creating the schema. 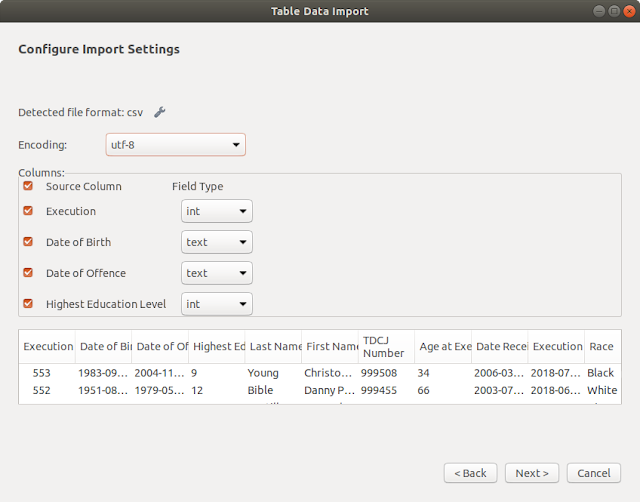 But Workbench will also has a wizard to open the CSV, let us name the columns, and import the data. 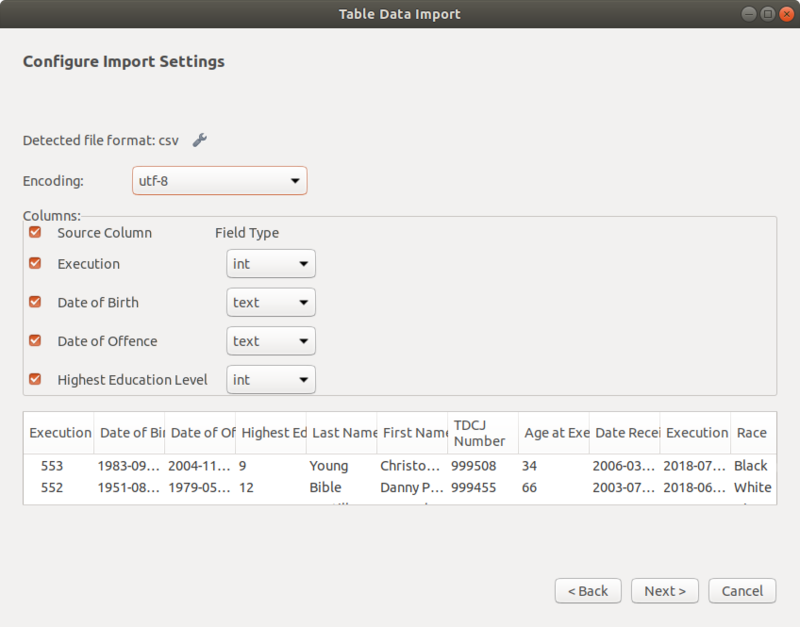 MySQL Workbench's import wizard is reached by clicking on a table icon and selecting Table Data Import Wizard. Now I have a big warning in that column names are copied from the CSV table first row. We could have changed Date of Birth to something like Birth_date but chose not to. This means we have to make queries like SELECT `Date of Birth` FROM tx_deathrow. But now we have a local copy of the data to use when working through the interactive book.